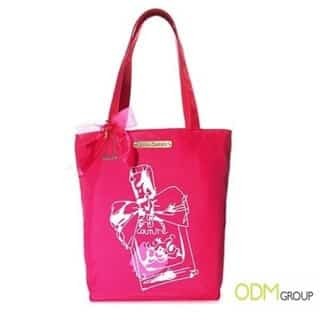 Juicy Couture is giving away their promotional customized tote bag as a GWP to customers! Simply purchase a large spray from the Juicy Couture fragrance collection. This GWP is definitely a valuable addition to any wardrobe of a fashionable person. It comes in a bright shade of hot pink which will never fail to get your attention. The practicality of a tote bag is unquestionable because it can be used for all purposes; from daily uses to traveling. This GWP promotion was found in Macy’s and it is only limited to one per customer, so hurry and get it while stock lasts! Why offer a tote bag as a GWP? Tote bags are very practical because they are lightweight and durable. Your customers can use them on many occasions as well. This GWP is also an eco-friendly alternative to plastic bag when they are used for grocery shopping. Who wouldn’t want to stand out and look fashionable during grocery shopping? Now they can, with this GWP. Offering freebies also ensures that you are getting your brand image out there. 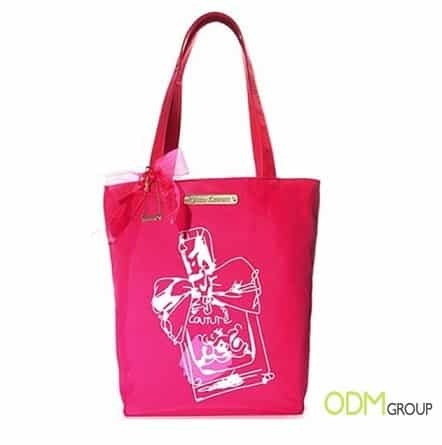 By using a tote bag as a GWP, you are entitled to a large surface area for branding your logo or message. This dramatically increases your brand visibility and awareness. By letting people know that your company is giving away freebies, it will definitely improve your company’s image and leave good impression on your customers. Furthermore, daily use of this GWP will ensure brand recall happens to your customers. They would be reminded daily of your brand and also instill a sense of dependence on your company. This will help build customer loyalty and also encourage repeat purchases from them. Therefore, don’t hesitate and contact ODMgroup to help design and kick start your very own marketing campaign today!